BetVictor one of the larger online bookmakers, particularly in the UK, with currently around 4 million visits per month. 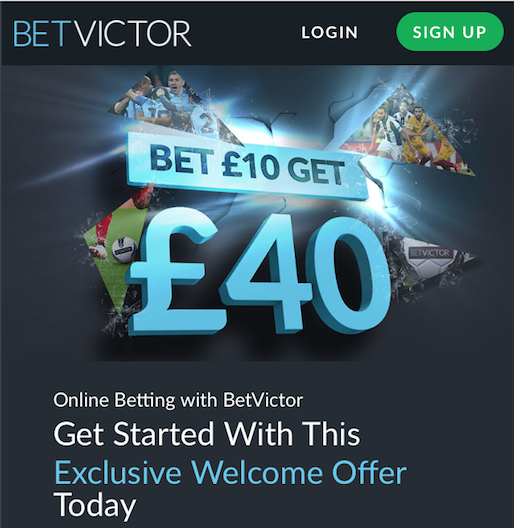 BetVictor has a proven track record of a reputable bookmaker and is known for offering better odds. BetVictor is a privately owned company. Nevertheless, you can be assured that BetVictor is a 100% reliable bookmaker. BetVictor is licensed and regulated by the UK Gambling Commission. And last, but not least, BetVictor offers outstanding odds and especially for Asian Handicap betting, the odds are one of the best of the market. You can benefit from excellent odds in UK football and the other major European competitions. There is an attractive welcome bonus package waiting for new sports bettors. £/€10 casino bonus funds will be credited upon placement of your first qualifying bet. Bonus fund stake will not be returned. 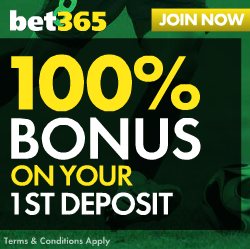 Deposits made through Moneybookers (Skrill) or Neteller are excluded from this welcome offer. This is an overview of how well BetVictor’s odds compare to all other prominent bookmakers (spoiler: Betvictor’s odds are fantastic in most markets). Odds for the major UK football leagues are definitely at the higher end of the market. BetVictor offers very attractive odds, and it is nice to know that it does not matter when the bet is placed: the odds are solid all the week and do not vary so much. This is very convenient, knowing that it does not matter so much when you place your bet. These attractive odds are provided not only for the English Premier League but also for the English Championship, the English League 1 and the English League 2. The odds of BetVictor are, in particular for the last 3 mentioned divisions, very attractive, compared to other bookmakers. If you frequently bet in these competitions, BetVictor comes highly recommended. Be advised that LIVE betting is average: BetVictor odds on Live Betting generate a payout ratio of around 94% for all football markets. Asian Handicap betting pays off a lot better: odds have a payout ratio of 98%. Champions League and Europe League odds are excellent when you bet the day before the match or on the day of the game. Timing is essential. The odds for the 4 major European competitions (German Bundesliga, Italian Serie A, Spanish Primera Division and French Ligue 1) are very reasonable and better than the market average, with payout ratios around 96%. For the 2nd tier European competitions (Turkish Super League, Dutch Eredivisie, Belgian Eerste Klasse and the Portuguese Primera Liga), the odds have payout ratios of approximately 94%-95%. LIVE betting is average: BetVictor odds on Live Betting generate a payout ratio of around 94% for all football markets. Asian Handicap betting pays off: odds have a payout ratio of 98% for all major competitions. Tennis: odds are slightly above average, but not for LIVE betting. Snooker: BetVictor offers average odds. Rugby Union: odds are slightly below average. Especially LIVE betting is not recommended. Aussie rules, the odds are below the market average. Australians betting on a weekly basis in the AFL should look elsewhere. The chart below provides a summary of the payout ratios we have calculated for you. These are for 1×2 bets. The payout ratios of other bets (such as Asian Handicap, Over/Under or Both Teams to Score) are provided on our BetVictor Odds Analysis Page. The chart below provides a summary of the payout ratios we have calculated for you. These are for 1×2 bets or Home/Away bets. For more details, including a comparison with the market average, are provided on BetVictor Odds Analysis Page. 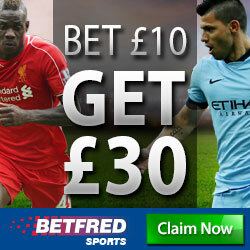 BetVictor has proven itself to be a very reputable online bookmaker that has been around for over half a century. 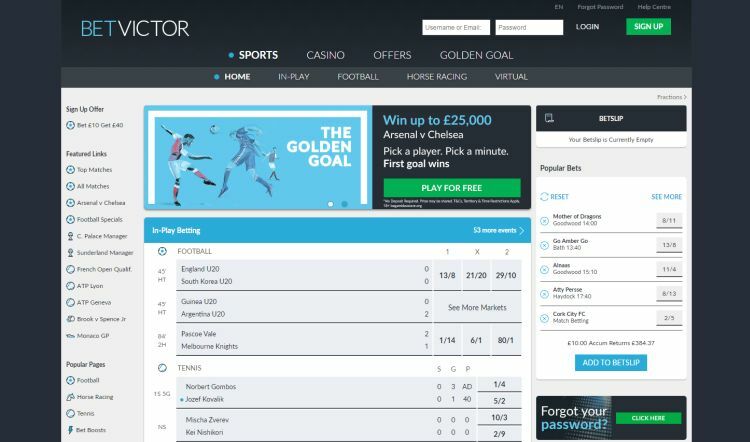 BetVictor is a large online bookmaker, with around 4 million visits per month. An annual turnover that is said to be around 1 billion GBP, with players in 160 countries. Well known for its sponsorships that include Liverpool FC and major horse racing events. There are plenty of reasons why BetVictor has been around so long. This is an excellent bookmaker, that was founded in 1946 by Victor Chandler. The odds on UK and European Football are very attractive, and Asian Handicap odds are amongst the best in the market. BetVictor also knows how to treat its many loyal customers. We do not hesitate to recommend BetVictor.